Pre-quilting life I mostly sewed clothes (I dont think you can call these garments…) and random home-dec items… however a jersey maxi-dress is the only one I wear with any regularity. I do keep eyeing the Wiksten Tank pattern though…. It was nice to meet you (and see your Washi) at the guild meeting! Awesome as always. 🙂 I have made a skirt in the past it was one of my favs! Cotton with applique on it. I should IG it. lol. And don’t worry I don’t tan either…curse of fair skin. My girls on the other hand tan like crazy! What a beautiful post …….just love the skirt. Your little cardy is gorgeous too. Thanks for the inspiration and sharing. Have a great day. 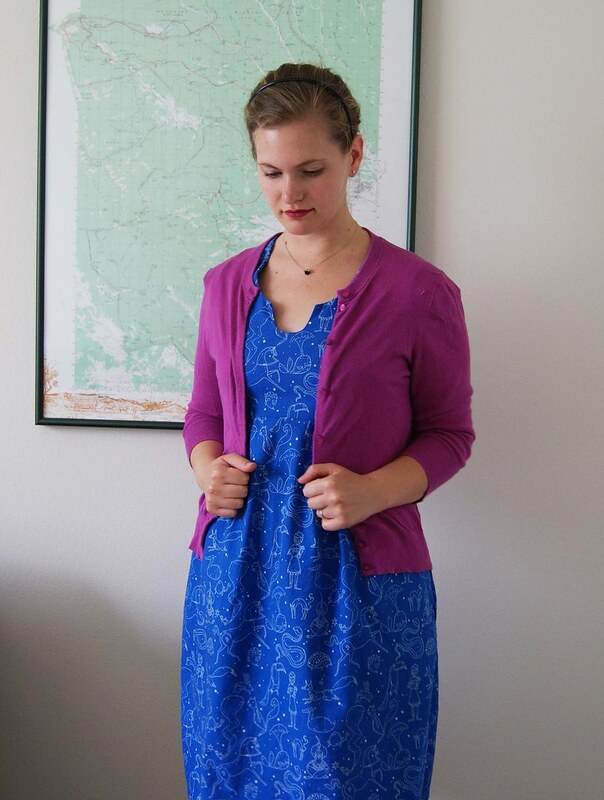 You have completely inspired me to get more into garment sewing again! As we speak (type..whatever), I have a half-done washi muslin on my ironing board – it really is such a great pattern! I havent braved sewing garmets yet. Maybe one day… Your look great I love the constellations print on the dress :). I also cant wait to see your xplus blocks together! Glad you had fun on your vacation! your skirt and washi dress look great!! I’m a quilt only sewer right now. I’ve never even done a bag, so you’re way ahead of me! Your skirt looks great! Very chic. I have not tried to make clothes yet. I’ve been thinking about it. Last Christmas I made some pjs for my niece and nephew, but that’s about it. 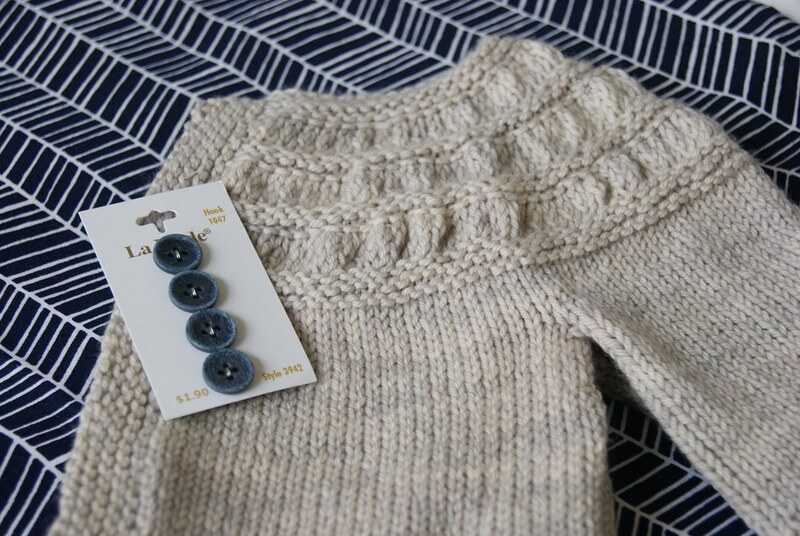 If you want to get an idea of all the garment sewing going on, go to Flickr and type on some pattern names….. You’ll find all sorts of amazing examples of clothing folks are making. But be careful you can lose some time looking…..
Oh my goodness, I love your Constellations Washi! 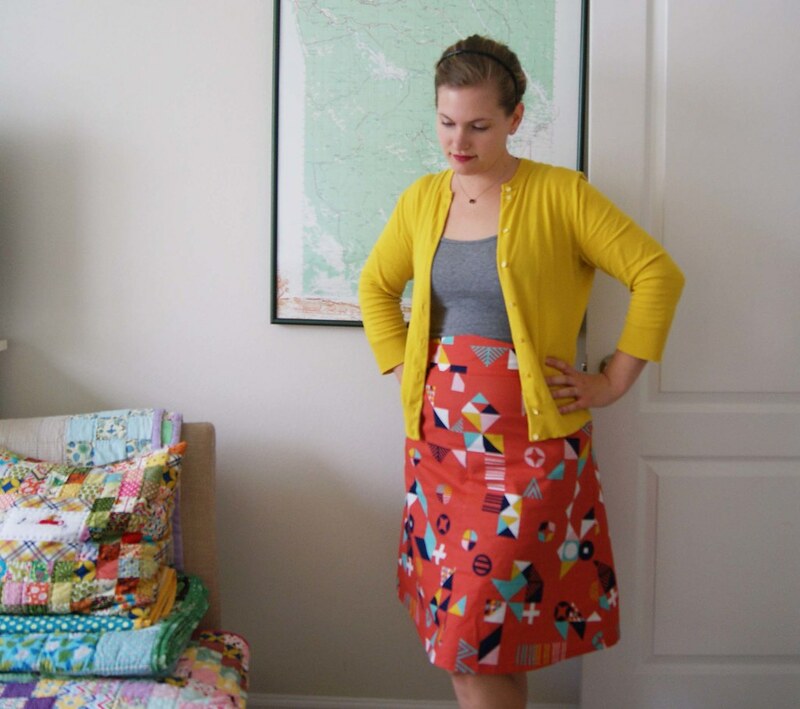 And your Tsuru skirt is fab! i can’t even. where do i start. you are my hero. a. that dress. it’s almost worth driving from NC to MA for you to teach me. like yesterday. the skirt- amazing. love the colors and that mustard cardigan – YES. Awesome combination! serious love. i’m not even going to comment on the X-plus blocks because I will be here all day. They are seriously stunning and I’m pretty sure the one on top is my favorite – I can’t believe you’ve already done 20. ahhhh. I have to start that soooooon. amazing. gorgeous! So much to love here! I started sewing specifically so I could make quilts, though I think someday I’ll tackle garments. I would absolutely LOVE to have either of these in my wardrobe. Oh and that sweater in adult size please! 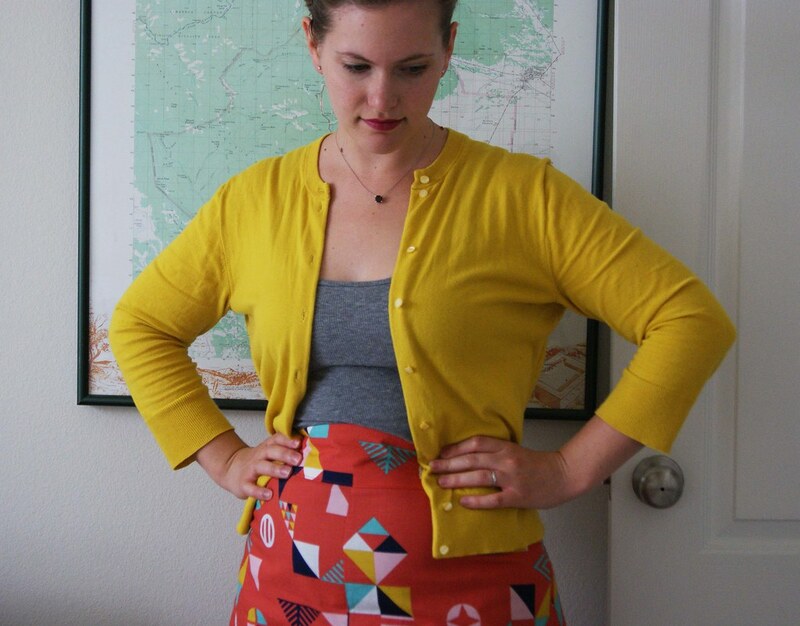 I know I’m terribly late, but I LOVE the skirt on you with that yellow cardigan. Please do wear things like that as it’ll help me be more adventurous! I really think you look fun and spicy! Ok, all of your clothes are gorgeous! 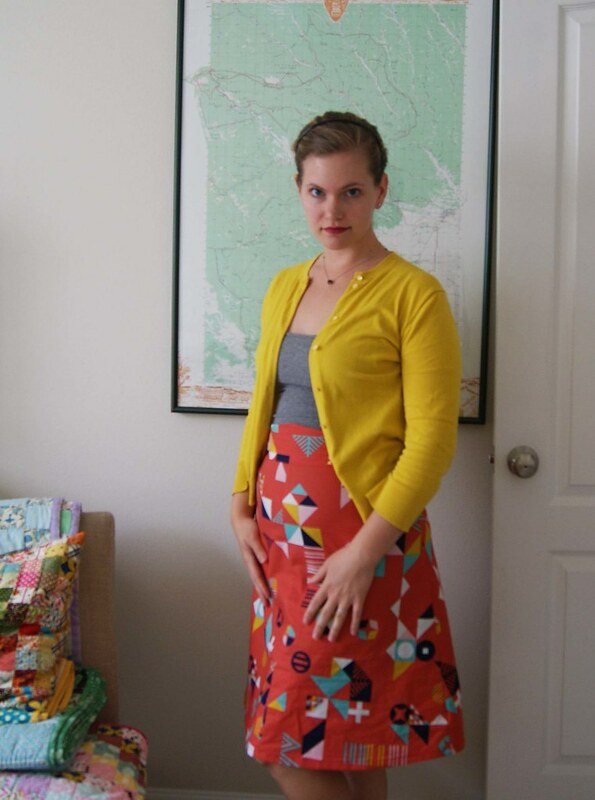 I used to make clothes for myself – but with two pregnancies in 3 years, I haven’t been the same size for more than a few months at a time in a while – making it not worth the time it take to make me something. Soon I hope! And can we talk about that chair in your background with all those gorgeous quilted goodness going on??? 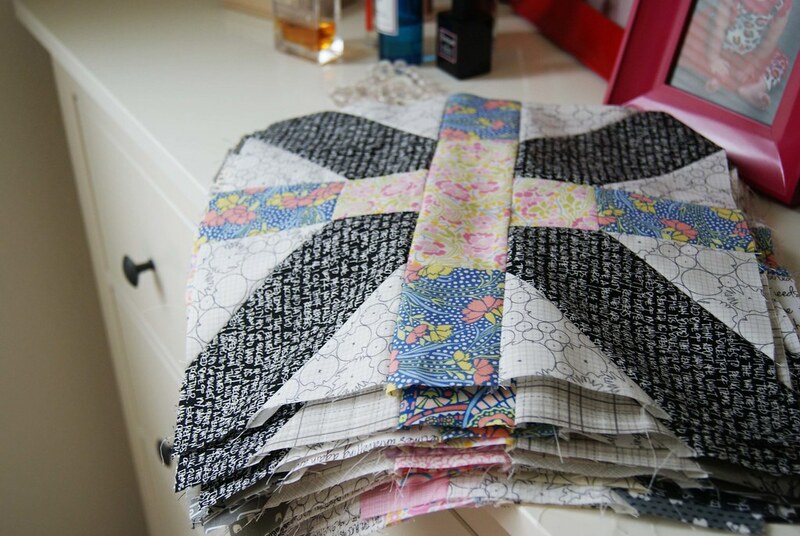 I am a sucker for a stack of quilts. PS. I’m a huge fan of high-wasited skirts to hide baby luggage. It looks great on you!